A highly versatile troupe of up to 6 performers using stilt walkers, acrobatics, fire and mime. Ideal roving walkabout characters or feature attractions for themed parties, conference dinners, festivals, private or corporate functions and events. A devilish ringmaster, jester, strongman and horse girl. These characters of the circus will bring any event to life with their unique brand of stilt acrobatics and dance. Fiery and lively in red, black and gold, this act is popular with circus themed events and parties. 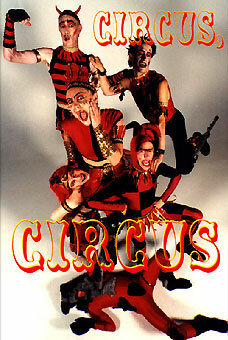 In addition, Circus Circus can be hired as a 15-20 minute fire, dance spectacular, incorporating daring feats on flaming stilts, dazzling flag and flare choreography and blazing fire staff routines. Because of the use of fire and small scale pyrotechnics, appropriate spaces (outdoor or indoor) are required. Contact us for more detail.